When friends consult me regarding what their next makeup foundation should be, I usually respond in 3 words: Guerlain or Chanel. Because Guerlain does undoubtedly the most natural and true finish looking foundations, with impeccable textures and Chanel does high standard, longlasting ones that photograph like no other. For now, this post will guide you to almost all the liquid and compact Guerlain foundations available in market at the moment. Colour-matching wise Guerlain foundations can be a very easy process, as soon as one understands the numerical system of their shades. Each shade has a 2 digit number. 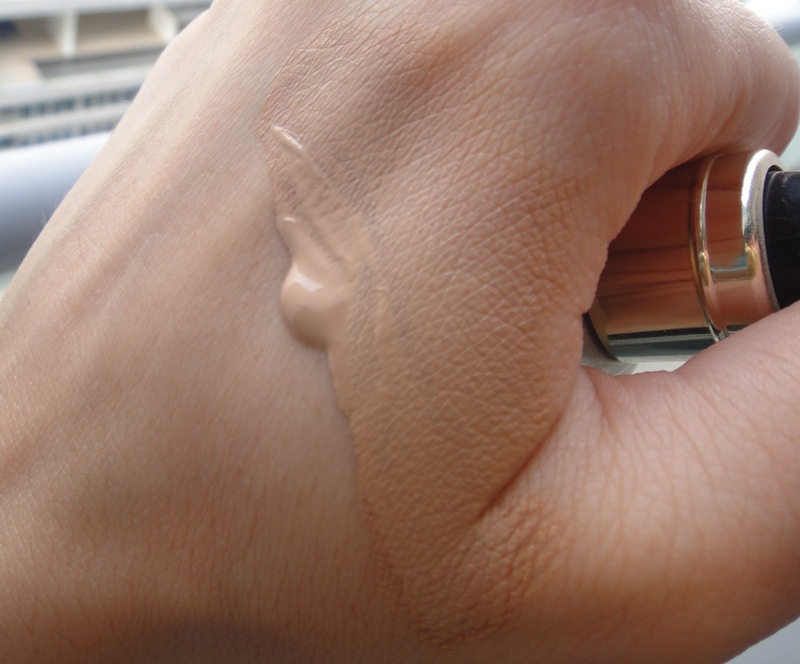 Shades starting with 0 (example: 02 beige clair), have Beige undertones. Shades staring with 1 (example: 12 rose clair), have Pink undertones. Shades starting with 2 (example: 24 dore moyen) have Golden Undertones and shades staring with 3 (example: 32 ambre cristal), have Yellow undertones. This light coverage foundation is part of Guerlain’s Terracotta range and for me one of the nicest and most multi usage products one can use. It comes in 2 shades: 01 blondes and 02 brunettes. It has a light mousse texture, which blends easily, is buildable, gives a velvety finish and makes you think of it more as a tinted moisturizer. Those of you who are sensitive to perfume you should know that it has a strong violety one, which just adds to the reasons I love it! The one in picture is 01 blondes and is dark enough to give you instantly a warm tone and even your complexion. Apart from fond de teint, you can use the product in many ways: either mixed with your moisturizer for a minimal coverage and bit of tan, or mixed with your regular foundation to lighten its texture and create a darker tone in case you have tanned and you do not want to purchase a new one. You may also blend Terracotta foundation as your contour colour on the hollows of your cheeks and “reshape” your face or even as a cream bronzer after your liquid foundation or before your powder foundation. Only downsides are the lack of SPF (in case you want to wear it exclusively during daylight) and the fact that you need to carry your powder and blot papers when wearing it, as it does not control the oil well. On the other hand, it is ideal for dry skins. At Guerlain’s site you will find more information about the product and here you will have the chance to purchase it online. 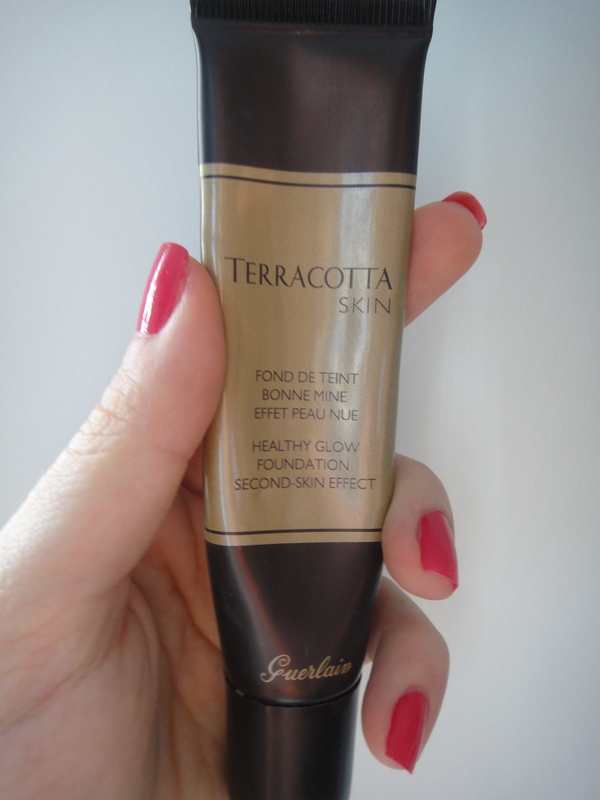 If you are looking for a true tinted moisturizer with SPF, Guerlain’s Terracotta range offers one called “Teint D’ Ailleurs“, which I will purchase later in Summer and review it for you. Lingerie de Peau is a light to medium liquid foundation, easily buildable, with smooth texture, good longetivity and the silkiest, most natural finish I have ever seen and feel in a foundation. No wonder why it won the Viva Beauty Awards 2011 and its new brother product Lingerie De Peau compact foundation and corrector (which I will purchase and review in a future post) won Marie Claire’s Prix D’Excellence award 2012. The foundation has 20 SPF, it is suitable for dry, normal and combination skins and it comes in 11 shades! The shade in picture is no2 beige clair, but my true match at the moment is no3 beige naturel. I still use the no2 though, mixing it with a darker matte foundation to prolong its longetivity. 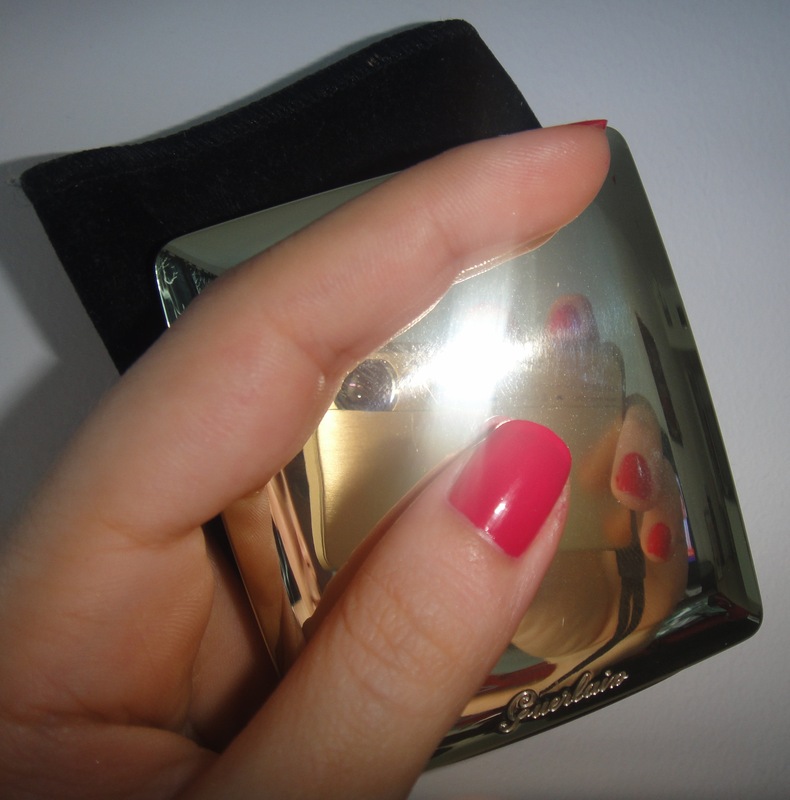 Check out Guerlain’s site for more information and purchase it here. Highly recommended! 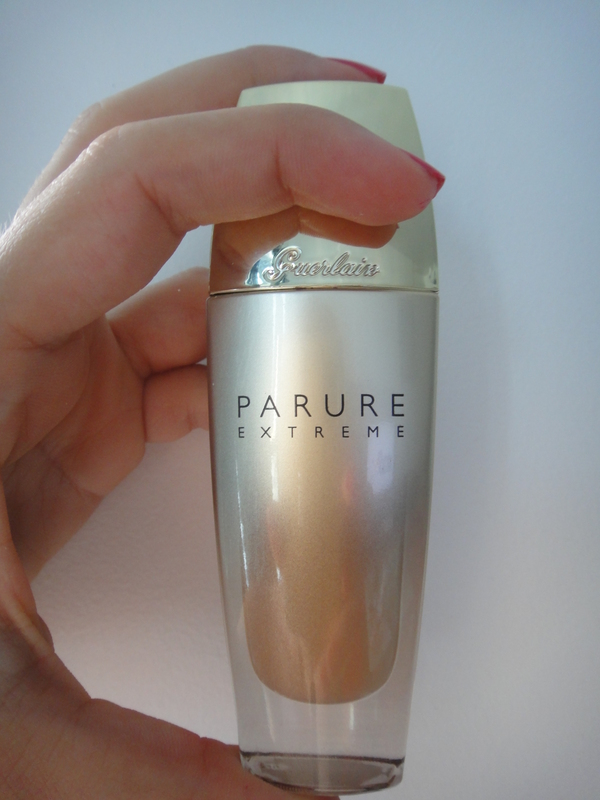 Parure Gold is a medium to full coverage liquid foundation, with a rich texture and a glowy satiny finish. 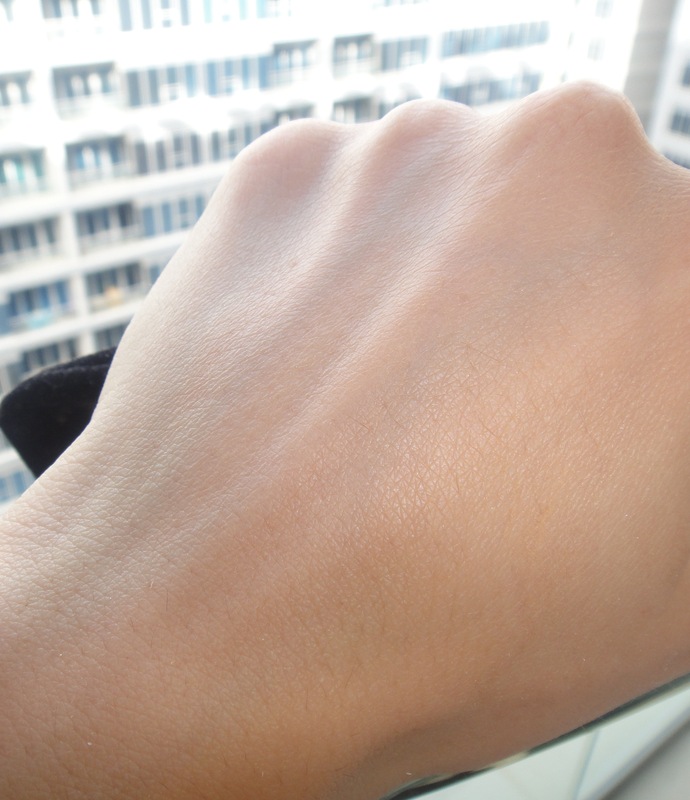 The longetivity is phenomenal and it doesn’t feel heavy on skin. It contains no SPF and it is very photo friendly. In this point I should add how nicely fills fine lines and smooths out skin texture. Gold is suitable for almost all skins and comes in 8 shades. The shade in picture is no2 beige clair and as you probably have already thought, seems a little dark for a no2… Yes you are right, due to its pigments the foundation comes a little darker than usual, therefore I suggest you either go a shade lighter than what you usually wear or do a true matching at Guerlain points of sale, waiting few minutes after application for the pigments to “sit” and reveal if the colour matches. Check out here for more information and purchase here. 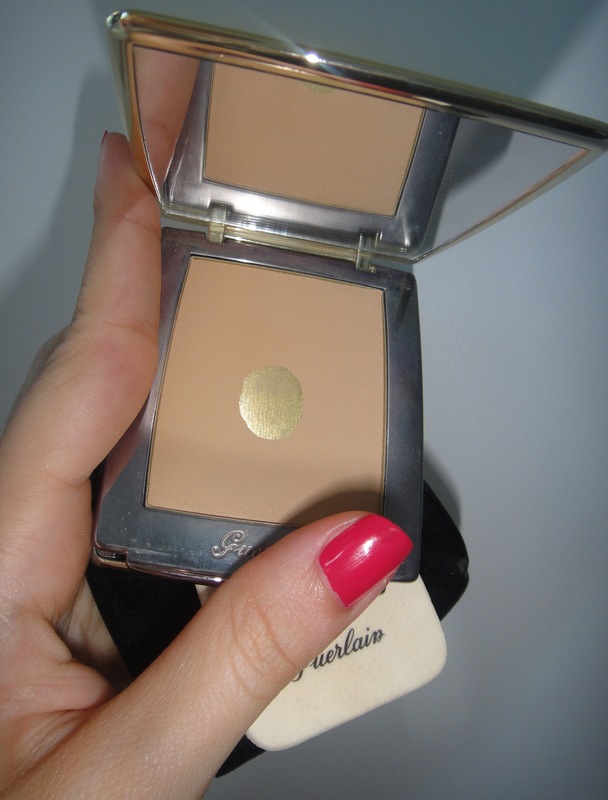 Parure Gold comes also in a compact powder form, which I do not own yet. Keep in mind that due to the fact the Gold powder contains pigments too, it also comes a shade darker than usual. Parure Extreme is a medium coverage liquid foundation, with a pigmented yet runny texture and a matte finish. It has exceptional staying power, even in humid weather and it feels very lightweight on skin basically due to its watery texture. It leaves the skin matte without looking flat- as many matte foundations do-, which makes it ideal for those with combination and oily skins. In this point I would like you to pay attention to two things. Firstly, the foundation dries quickly, hence you need to work quickly on the skin in order to blend and build evenly. Secondly, before you decide you want Extreme in your life, spend some time in the point of sale doing a good colour match and make sure you take sample before you purchase it because the foundation tends to oxidize. Makeup oxidizes due to environmental or skin conditions (oily skin), turning orangey or a shade darker. In the second picture you see no3 Beige Natural. 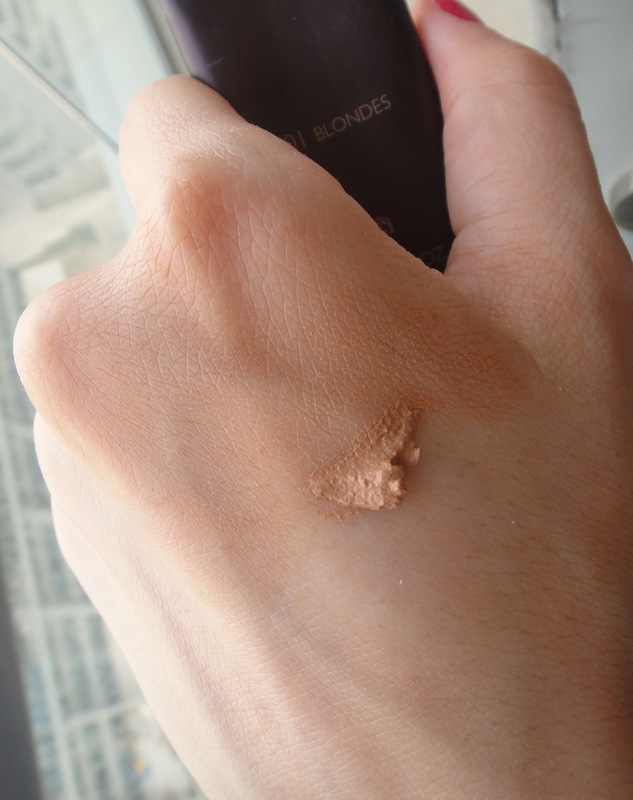 No3 is relatively darker than no3 of other Guerlain foundation lines because it oxidized! As it turns darker on me, I usually mix it with a lighter matte foundation to create a custom made colour. Parure Extreme comes in 8 shades and has an SPF of 25. Parure Extreme is now discontinued but you can still purchase it from here. 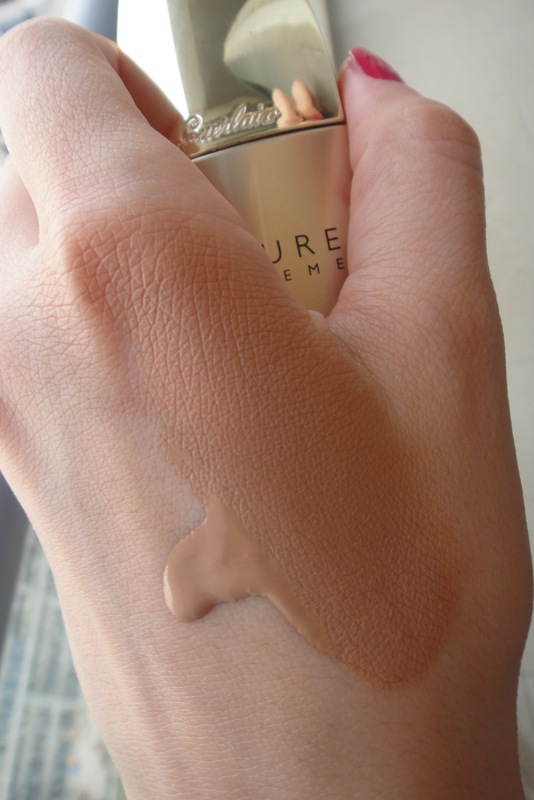 Parure Aqua is a light coverage liquid foundation, with a fine, silky texture. It goes on like butter, it is buildable and gives a beautiful dewy finish. Ideal choice for mature skins as it keeps the skin moisture, making it look fresh and rested! It has an SPF of 20 and it comes in 12 shades. In the picture you see no2 Beige Clair. 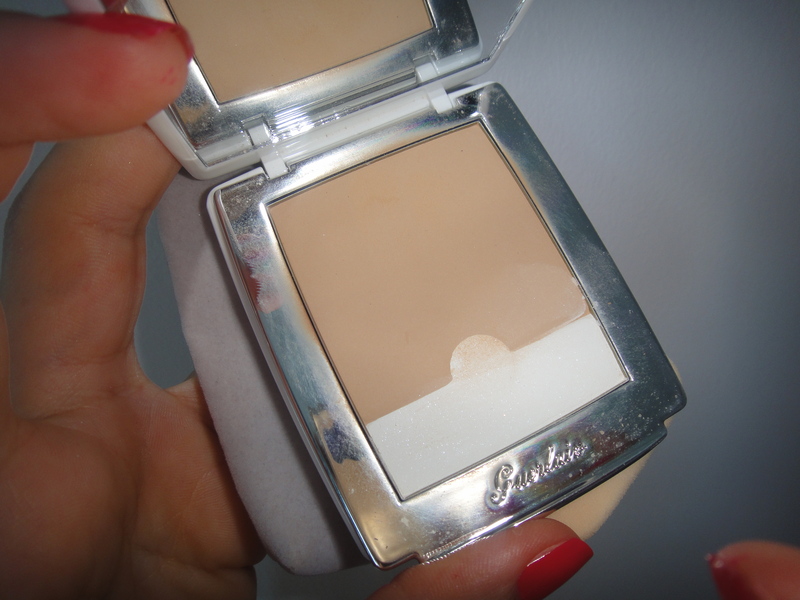 This foundation is now discontinued and replaced by similar textured Parure de Lumière. Parure Compact Foundation is a finely milled powder foundation, which gives a nice dewy finish, keeping the skin oil free. It provides light coverage, which you can build up to middle. Surprisingly I haven’t received as many compliments on how my skin looks, as the times I was wearing this powder. Why am I impressed? Because I do not spend much time neither applying it, nor blending it! It goes on smoothly and has amazing staying power. What Guerlain calls Crystal Pearls in this product is the reason why people see a “natural glow”, which is clearly shown in the third picture! I used flash when taking the pictures, so that the camera would pick up the effect. I have the powder in 03 Beige parfait and I like to use it either with the sponge that comes in the compact (for rich coverage) or with fluffly brush (for sheer coverage) after I have sprayed my face with Neal’s Yard hydrating mist or have applied blanc de perle make up base by Guerlain which I will review along with few primers and other bases in a future post. The Powder comes in 10 shades and has an SPF of 20. Check out the product here and purchase it from here. Blanc De Perle Brightening Foundation is a very finely milled powder, which gives you the option to customize your finish: either matte or dewy. For a matte look use only the powder that matches your skintone. For a dewy look mix evenly the two powders together and apply. The second picture from top, shows the powders without flash. Notice in no3 picture how pearly the white highlighter/ corrector is under flash lights! The last picture shows you the dewy finish you can achieve by mixing the powders. You can also build the coverage you want, from medium to full. This powder is in 03 Beige nature. As I also like to do with the Parure compact foundation, I either use the sponge that comes in the compact (for rich coverage) or a fluffly brush (for sheer coverage) to apply the powder. For a more natural look, before the powder I spray my face with Neal’s Yard hydrating mist or apply blanc de perle make up base by Guerlain, which I will review along with few primers and other bases in a future post. The Powder comes in 6 shades and has an SPF of 20. Check out the product here. Now, I am not sure whether you can find the Blanc de Perle range in Europe, Australia and the Americas or not, but I am sure it is available all over Middle East, India, China, Japan. Stay tuned for a post that I will do about the new Blanc de Perle liquid foundation. 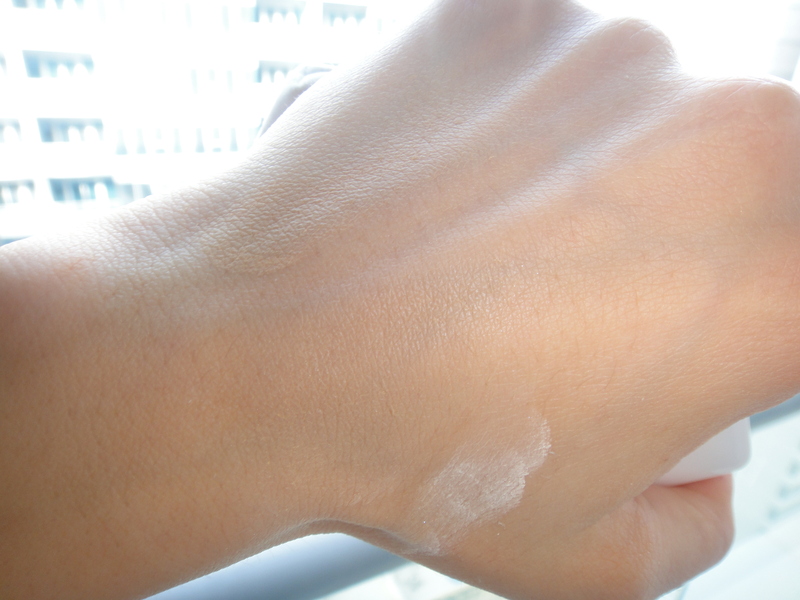 For Blanc de Perle liquid foundation and corrector, visit my new post here. This entry was tagged blanc de perle, fond de teint, foundations, guerlain, lingerie de peau, make up, parure Aqua, Parure de lumiere, parure extreme, parure gold, soins de teint, Terracotta Skin. Bookmark the permalink. Wonderful post, well written & explained, as well as very very useful :)My personal choice is Lingerie de Peau in shade 02 and I love it like no other, next up is Chanel VL Aqua. 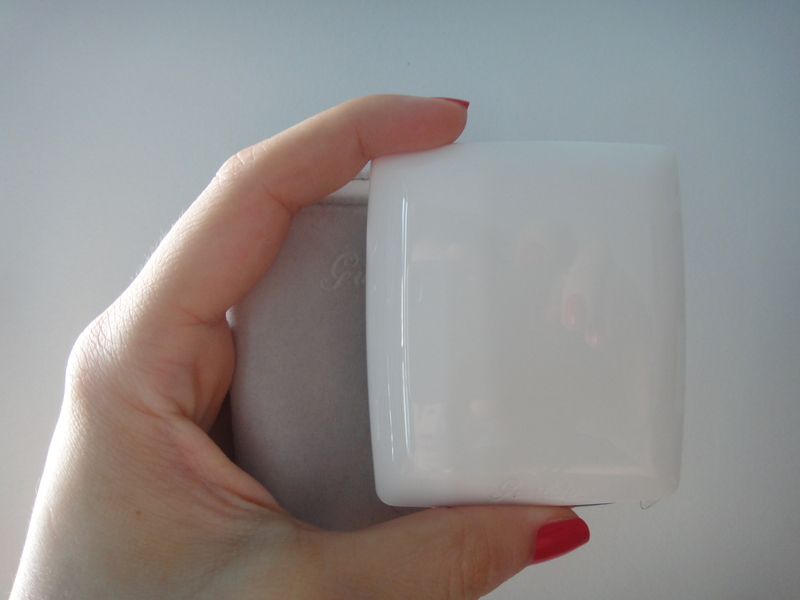 Thank you for such an in-depth user review of guerlain. Now, is there a review of your chanel collection for complexion? Looking forward to it! Thank you so so much. I’m using Lingerie de Peau, and absolutely love it. I was looking to get Parure Aqua, I know it’s discontinued, but you still can find it online. I’m 30 yrs old and my shade is # 02. DO you find that they are similar or any major difference. I like using light coverage. Am glad you liked the post. Parura Aqua was a great foundation and very light weight. 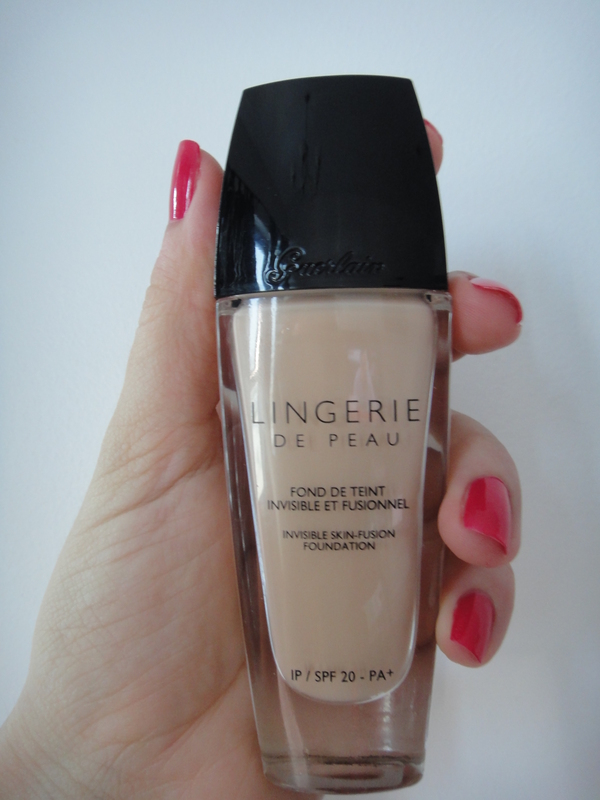 Lingerie de peau liquid foundation is a little more full bodied that Aqua and definitely more matte. I dare to say much more long wearing too. It is lightweight, long wearing (longer than Aqua), with a velvet finish. I currently use this one and LOVE IT! If you are interested in it make sure you pick up a shade darker than what you usually take as it turns darker while on skin (not oxidised). 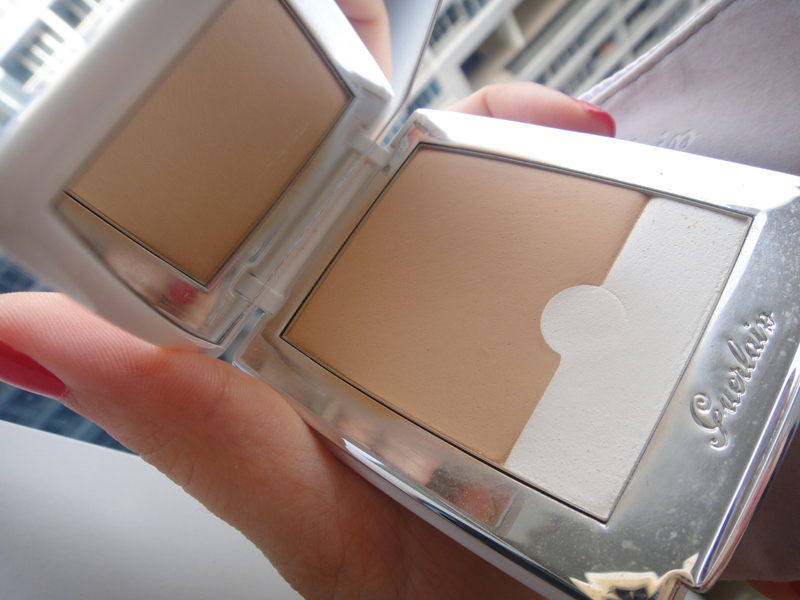 I was thinking that cream-compact foundations are usually for aged skin, but I will give it a try for sure. Your reviews are THE BEST so far))))) . Keep it that way!!! Also-what do you think about Guerlains’ primers? Guerlain primers in my opinion are working more like skincare products, rather than fulfilling the purpose of a true primer. I have tried the Meteorites (pink balls) and the L’Or (golden flakes). To be honest, none of them were outstanding in terms of making the foundation lasting longer. I expected that the Meteorites would be able to soften the redness of my skin(as it is advertised), but did nothing about this. However it provided a healthy luminosity. As for the L’Or, it left my skin well hydrated BUT red, due to the amount of alcohol in it. Did you try the primers out? 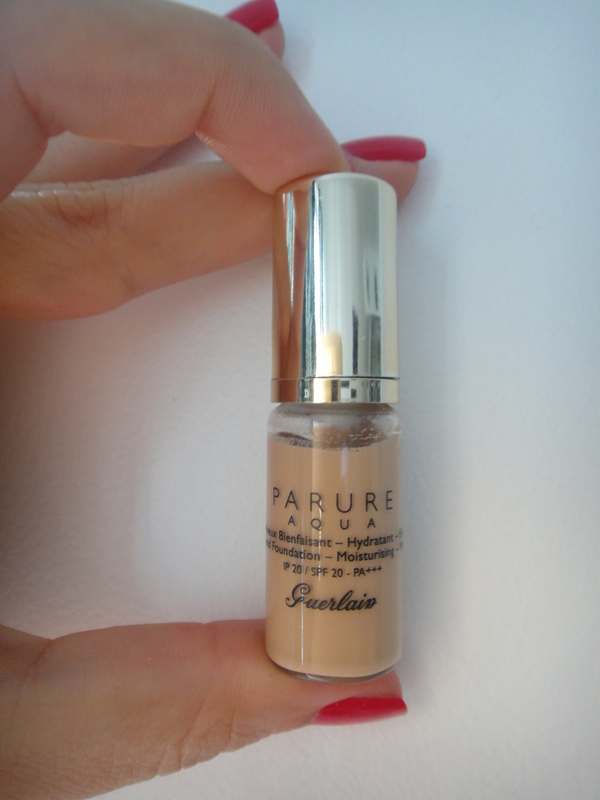 parure gold liquid foundation DO have spf15. i dont know what to chose ? Love this post! The explanation regarding the shades was very educational. I really want to try Lingerie de Peau in Ambre cristal #32 but it is not available in the United States! Do you know of any website where I could purchase it and have it shipped internationally? On a separate note, have you tried the BB cream? As for the BB lingerie de Peau cream, I do have it in “Light” and in one word I can describe the product as “disappointment”. It has a thick consistency that dries out very fast (so you have to apply it super quickly), it has an annoyingly matte effect (almost like mask) and the colours run lighter than expected. On the contrary, I have found out that their Meteorites Baby Glow light fdt works more like a BB, though it doesn’t last as long on skin.